Ceratochilus biglandulosus #1699 (wild capsule on imported plant) (approximately 25 seedlings per flask). 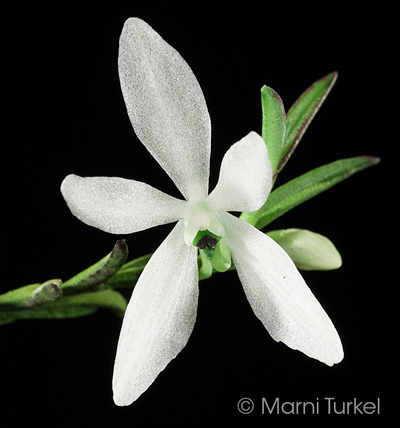 The Species: The flower is a sparkling white with an emerald green lip. 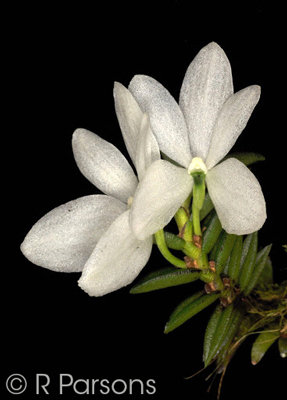 The flower is from 1" to 1.6" tall and the leaf span of the plant is also about the same dimension. The plant can have up to 3 flowers per inflorescence and they are open at the same time. The flowers can last 2 months or more. It is a pendant plant with the apex upturned so it is best grown mounted. This is found only in Java where it grows at elevations between 3300 and 6600 ft but is usually found between 5000 and 5600 ft. 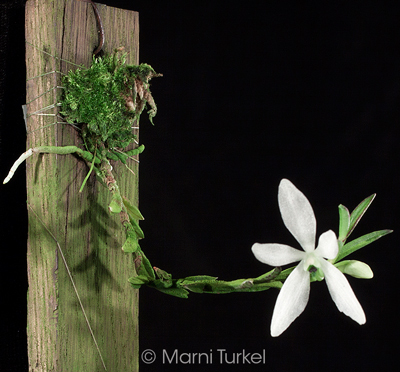 It grows on the exposed smaller moss covered branches and twigs. Culture: Because of the pendant habit, this is best suited to be grown mounted. It can be grown in cool to intermediate conditions with high humidity and regular watering with dilute fertilizer. Give it gentle air movement and bright diffused light. This species can bloom at any time of year. They don't adapt well to warmer temperatures. Ceratochilus biglandulosus images. I do not have an image of the capsule parent, but these show the species very well.